The latest consistory meeting reminded me that the elders are chaffing at the bit in their eagerness to get into their annual home visits. Delightful; enthusiasm in the Lord’s service is contagious! So in the coming weeks each address in the congregation may expect an approach from their elders for a visit. Each of us, of course, are eager to receive them. Why, though, would the elders leave the comfort of their homes (after a hard day’s work) to visit you? What motivates them? Why do a home visit? From his place in heaven on high, our ascended Savior gave elders to his church on earth. The reason he gave those elders was, says Paul, “to equip the saints for the work of ministry” (Eph. 4:12). With the saints doing “the work of ministry”, the church as a whole is built up to maturity so that together we can handle the storms of life (see Eph. 4:13-16). How, though, ought the elders “to equip the saints for the work of ministry”? Obviously not by staying at arm’s length from the saints. Paul answered the question for the elders of Ephesus in another place: “Pay careful attention to … all the flock, in which the Holy Spirit has made you overseers, to care for the church of God, which he obtained with his own blood” (Acts 20:28). Paying “careful attention” involves stepping into the lives of each of the congregation members. The best place to step into their lives is surely the home. In their visit to the home the elders seek to get a sense of how each person is doing the work of ministry to those in his circle – be it the smallest circle of marriage, the larger circle of children and parents, the bigger circle of school mates, work mates, neighbors, etc. To get a sense of how each member is doing, the elders try to initiate an open conversation with those visited. The topic of conversation is obviously not simply the recent Blue Jays’ game; the elders instead want to hear about your walk with the Lord and what that looks like in your relation with your neighbors. The precise focus of the conversations intended for this year – well, that’s discussed below. First I want to mention that what gets said at a home visit does not get shared with anybody else, not in consistory meetings either. At the consistory meeting the elders will share the fact that they’ve visited with you (and the date), plus a qualification whether the members’ relation with God is healthy or not. So: please don’t hesitate to speak candidly with your elders. Who takes part in the visit? Obviously, the elders do. These elders are two normal people, men who struggle with the same sort of questions and injustices and joys as anybody else. Perhaps these two men are well known to you; perhaps they are not. The important thing to remember, though, is that they do not come to your home on their own authority. They will ask some very personal questions, and you may be much inclined to reply that the answer to those questions is simply not their business. Please be aware, then, that no elder comes because he is nosey or bored. Instead, your elders come to you because none less than Jesus Christ cares about you, and so has sent his ambassadors. The comforting thing is that Christ Jesus already knows what is going on in the hearts and lives of each one of us. To guide and encourage and correct us (as the case might be) he sends particular men whom he has called to the office of elder. In real terms this means that one needs to prepare for the home visit genuinely, welcome the brothers warmly, and be determined to be open with them. Remember that the brothers have done a full day’s work, have left their family (again) to visit you, and are no doubt somewhat nervous as they step inside your home. Treat them as honored ambassadors of Christ, including praying for them before the visit, dressing up to receive Christ’s ambassadors, and during the visit being open and honest with them, as if Jesus Christ himself were present. Equally obvious is that the entire family ought to be present for the visit. Each member of the family, after all, belongs to Jesus Christ, and he is interested in them all. As a rule of thumb, anyone old enough to go to school should be present for the visit. Parents do well to explain to the children ahead of time what the visit is about, what the children should expect, and also what attitude they ought to have towards the elders, namely, receive them as Christ’s ambassadors, and so be open and honest. Parents should also ensure that each family member is dressed appropriately for Christ’s visit, have his or her own Bible and Book of Praise at hand, and is ready and waiting when the elders arrive. Of course, at the kitchen table God’s blessing should be sought upon the visit beforehand. The whole family need not be present for the entire evening. In fact, the elders will want to engage the parents in discussions that best happens when the children are not within earshot. The elders will typically close the children’s portion of the home visit with prayer, commending each child’s circumstances to the Lord’s care. Parents would do well at that point to send their children to their rooms (and perhaps tuck them in) – and then give the elders opportunity to speak more personally with the parents about the issues of their lives. Once that part of the visit is complete, the elders will again lead in prayer, with both thanksgiving and petition for what they’ve heard. What sort of things will be discussed? Below is a random list of the sorts of questions that may come up for discussion. Of course, the elders may see need to raise areas of life other than these. In fact, they will invariably raise the theme chosen for the year (see below). Have you grown in your service to the Lord since the previous visit? If so, how? If not, what might explain the lack of growth? How could you improve that? What are your personal Bible reading habits and prayer habits? How does your Bible reading help you handle the demands of the day? What are your family Bible reading habits and prayer habits? How do you as father use the Bible reading as an opportunity to teach the family further in the Lord’s way? Do you pray for your children’s individual needs? Do you as husband and wife know what goes on in each other’s hearts? How do you lead and support the other in the burdens and trials the other carries? Do you as father and mother know what goes on in the hearts of your children? How do you guide them further in life’s questions? Are there any matters in your personal or family life that would require the elders’ (or deacons’) special attention? Be prepared to raise the matter in the course of the visit. How do you work with the preaching the Lord sets before you Sunday by Sunday? How do you lead your family in benefiting from that preaching? How are you involved in congregational life? Would you describe yourself as a living member or a sideline member? Explain why you answer as you do. What strengths and/or weaknesses characterize the congregation? What thoughts do you have about making the most of the strengths for God’s greater glory? What thoughts do you have about correcting the weaknesses? What contribution could you make to encourage healthier church life? Do you follow the work done on the mission field, and support it in prayer? Why or why not? What are your thoughts in Smithville being involved in local mission work? Why do you answer as you do? How do you support the needs of other congregation members to obtain a solidly God-focused education? Explain why your support is as it is. Do you willingly give your first fruits to the Lord, or do you do it grudgingly? Explain why you feel as you do. The theme Consistory settled on for the home visits this year is submitting to one another out of reverence for Christ (that’s a quote from Eph. 5:21). That sentence leads the apostle to speak in the next verses about the relation between husbands and wives (5:22-33), children and parents (6:1-4) and employees and employers (6:5-9). It is no secret that we are a large congregation (and we’ve grown in the last few months) so that the elders have their hands more than full in shepherding well the Lord’s flock in Smithville. In fact, there is more work than the office bearers are realistically able to do. Since the Lord has given elders to his church “to equip the saints for the work of ministry” (Eph. 4:12; see above), it’s clear that the Lord would have all (congregational) hands on deck in serving one another. To encourage the members to fulfill this God-given task, the elders will initiate a conversation on that theme of submitting to one another out of reverence for Christ. As Christ submitted to the needs of those the Father gave him (to the point of dying for them! ), so –out of reverence for Christ– the redeemed submit themselves to the needs of those around them – be it first in marriage, then in family, then in the workplace. And of course one can add other circles of relations to the one Paul listed in Ephesians 5 & 6. It is my intent to work this material out further in a sermon devoted to this home-visiting theme in the near future. As the elders explore this theme with you in their visit, they may well end up reading with you from Ephesians 5 and 6. So it may be reasonable to discuss that passage with the family before the elders come. The questions listed below could perhaps help with that conversation. 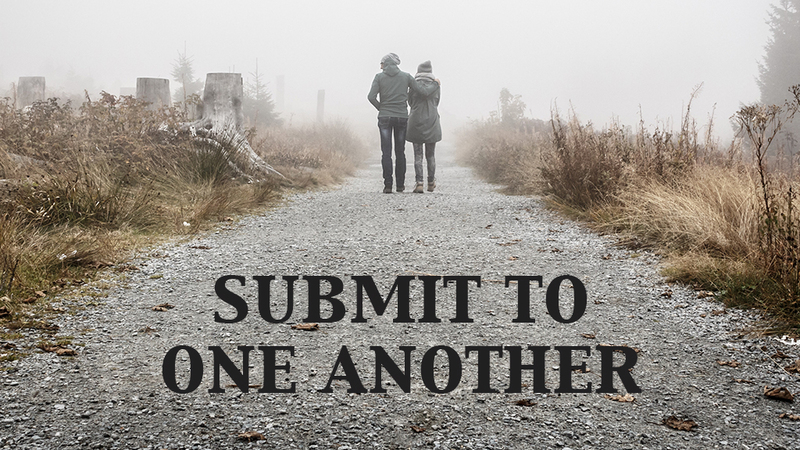 Why would the Lord have us submit to one another? Whose example are we to follow? In your marriage (see 5:22-33)? In your family (see 6:1-4)? In your workplace (see 6:5-9)? Perhaps none of these categories fits neatly in your life. God, though, has put others on the path of each of us, and so “submitting to one another” still applies. Give examples of what your submitting to another looks like in your life. Please take a moment to discuss your answer with the person(s) your submitting to. What have you done and/or what could you do to help others in their struggles to submit to those in their closest circles in a manner that reflects Christ’s submission well? We are a big congregation, and obviously the office bearers cannot do all the encouraging and instructing and comforting and admonishing that needs to be done. How do you submit to that bigger circle of the entire congregation? Those around you may have (at least in your opinion) made it very difficult for you to submit to them. Do you hold a grudge against the other person (or persons) that makes it difficult to submit and to serve him/her? What does your forgiveness of his/her wrongs actually look like? It is my prayer that the Lord graciously bless the labours of the elders at your home this year richly, and equally the labours each of us do to support and encourage and guide the other. After all, it’s all about Christ’s glory, and so our growth in him.